Oh what a marvellous introduction to Jordan this is. Predominantly a Greco-Roman city, north of Amman, it comes a close second to what most people flock to Jordan for, Petra. An extensive city of ruins, I was truly mesmerised by the way the architecture had been preserved. Almost better than most places in Italy and Greece itself! 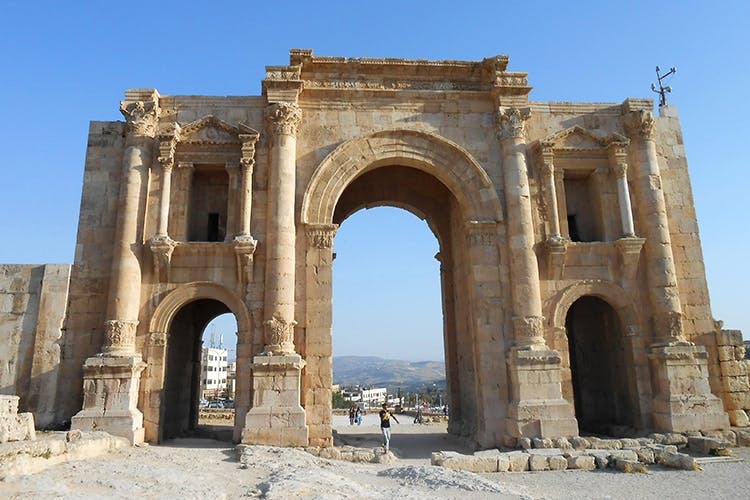 Hadrian’s Arch – the triumphant arch which you can also find in Athens, welcomes you to the city, and after taking plentiful photos, the Oval Plaza and the Collonaded Streets beckoned. Standing the test of time, they are marked by still-standing Doric pillars that lead you to the Hippodrome, Cathedral and the North and South theatres. Make sure to stand at the marked spot in the theatres and make your travel companions listen at the very top – crystal clear sound and winning acoustics! For a whirlwind history lesson, swing by the museum for a glimpse of pottery, figures, precious stones, mosaic and even marble remains.